Depleted wild c rocodilian populations are usually managed primarily on the basis of conservation alone - that is, to rebuild them. The public is usually very supportive of such efforts to “help” endangered crocodilians populations to recover. However, most crocodilians are potential predators on humans and/or livestock, and the successful recovery of wild populations often reinstates human-crocodilian conflicts (HCC), leading to negative public attitudes about those same crocodilian populations. For the CSG, successful conservation and management programs have resulted in recovering crocodilian populations in many countries around the world. The challenge in many of these cases now is how to maintain those populations in the face of increasing HCC. In recognition of the importance of dealing with HCC in ongoing management of crocodilians, in 2002 the CSG established a Human-Crocodile Conflict Working Group, which was headed by Dr. Rich Fergusson and Allan Woodward at different times during its period of activity. HCC could be considered to include “any interaction which results in negative effects on human social, economic or cultural life, on conservation of the species or on the environment”. 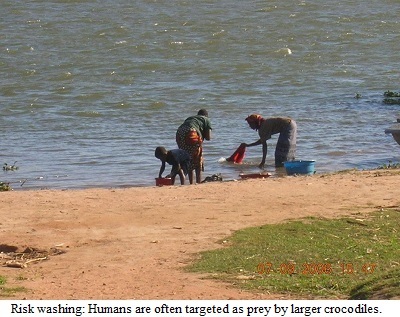 However, HCC more commonly refers to interactions between crocodiles and humans where they or their livestock are threatened, injured or killed, or livelihoods are affected (eg damage to fishing gear, loss of catches). At the 22nd CSG working meeting (Sri Lanka, May 2013), the HCC Working Group agreed to develop case studies on HCC from different parts of the world, and how communities and authorities are addressing the problem of "living with crocodilians". A number of papers at that meeting dealt with HCC (eg see Tisen et al. 2013; Sivaperuman and Kumar 2013; Sivaperurman and Jayson 2013; Manolis and Webb 2013; Sideleau and Britton 2013; Lading 2013; Rao and Gurjwar 2013), and a special session was devoted to HCC at the 23rd CSG working meeting in Lake Charles, Louisiana, USA (May 2014) (eg see Woodward et al. 2014; Manolis and Webb 2014; Ponce-Campos 2014; Stevenson et al. 2014; Pooley 2014; Fukuda et al. 2014; Sideleau and Britton (2014); Carrillo-Rivera and Porras Murillo 2014). Simon Pooley (University of London) has recently (April 2018) compiled "Croc Digest: A Bibliography of Human-Crocodile Conflicts Research and Reports" which aims to "serve as a first point of reference for researchers interested in human crocodile conflicts, and offers policy makers and practitioners a wide range of information on and approaches to mitigating such conflicts". It is recognised that more information and research are needed on crocodile populations, the incidence of HCC, factors increasing the risk of HCC, and countermeasures that can be employed, including harvesting to reduce crocodilian populations. However, harvesting alone is unlikely to provide a solution to HCC. Robert Godshalk, working in Venezuela in 1978, carried out interviews with local residents and retired crocodile hunters who operated in the 1930s and 1940s, on the status of the Orinoco Crocodile (Crocodylus intermedius). Historically, livestock losses were commonplace, as were attacks on people. Understanding the potential danger, all homes had a safety fence at the water's edge, from which water could be drawn safely. The fence typically comprised 2 m poles free standing in the sand/mud, was generally round in shape, about 3-4 m across, with the waterline cutting across the diameter. The entrance from the bank was just a space, where a pole was not placed. More than one person informed Robert that a gate had to be fashioned across the opening as crocodiles had made their way around the back of the enclosure, and lay in wait for the water collector! The enclosures had to be dismantled and moved as water levels in the river rose and fell during the seasons. These enclosures were not common in 1978, and are just fading memories to older folks now. With the drastic reduction in crocodile numbers due to hunting in the past, today's river people have not experienced the crocodile danger of their predecessors, and crocodile exclusion enclosures in Venezuela may be relegated to the history books. 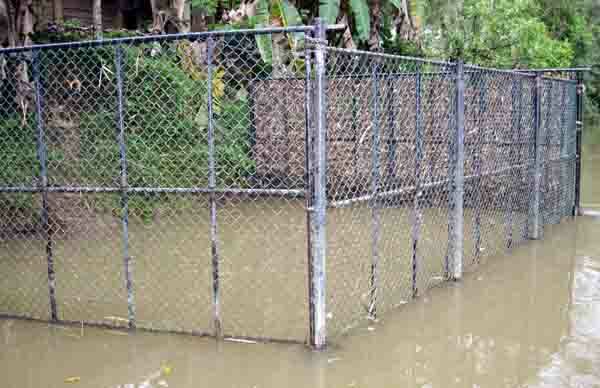 Traditionally, Crocodile Exclusion Enclosures have been used in the southern "wet" zone of Sri Lanka to reduce risk of attack by Saltwater Crocodiles (C. porosus) (De Silva 2011). Known as "kimbul kotuwa", in the Sinhala language these are relatively simple structures, with three sides, often constructed using wooden poles. Since around 2007, more elaborate structures constructed with steel poles and wire mesh have been established. Interestingly, CEEs are not used by people living in most parts of the "dry" zone inhabited by large populations of Mugger Crocodiles (C. palustris). CEEs are used by people for personal use (eg bathing, washing clothes and household utensils.) and occupational needs (eg laundrymen, brickmakers) (Samarasinghe 2013). CEEs in Sri Lanka are categorised into 3 main types. Type 1: small (3 x 3 m) enclosures are used for personal use by the respective householders. Type 2: built for communal use, constructed of thick kitul palm (Caryota urens) planks or long hardwood poles driven into the river bed. Type 3: large public CEEs erected by government authorities (Disaster Management Coordination Unit, Matara). The side at the bank is open, in all three types of CEE, and although a rare occurrence, crocodiles have been known to walk around and enter enclosures. 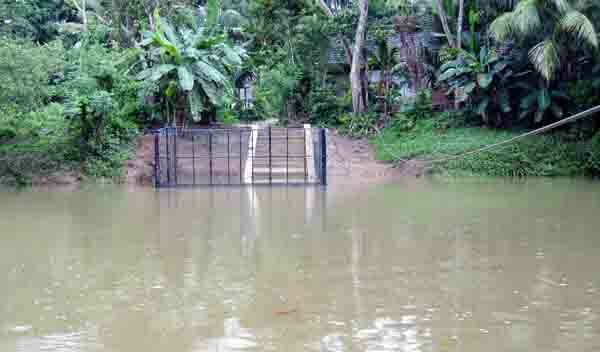 De Silva (2008) recommended 4-sided CEEs, with a gate, to reduce the risk of crocodiles entering from the land area. In Matara, the DMCU is currently engaged in a project to build 45 Type 3 CEEs. The biggest constraint is the lack of funding, with each CEE costing around $US2500-3200. During the monsoon season all types of CEE are damaged,. Some Type 1 CEEs are completely destroyed. Mud and leaf litter accumulate on Type 3 CEEs. Interestingly, most, if not all, attacks occurred where people were bathing or washing outside a CEE, where there was no CEE at all, or where CEEs had not been maintained properly (Somaweera and De Silva 2013). 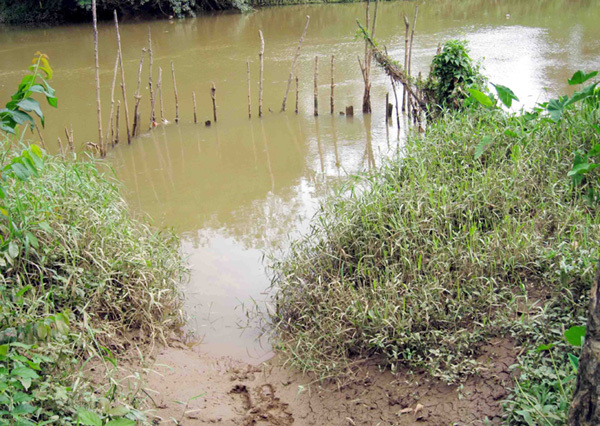 In the Nilwala River there had been no attacks on people using Types 2 and 3 CEEs, but in 2012 there was an attack on a young girl in a Type 1 CEE (Samarasinghe 2013). However, some poles were missing from this personal CEE, and the crocodile was able to enter the CEE, grab the girl, an carry her away (Anslem de Silva, pers. comm.). 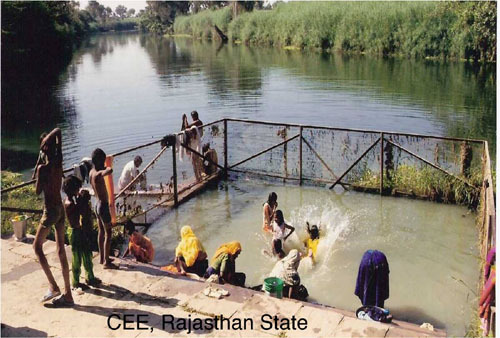 Protected bathing ghats are used in India to exclude crocodiles. The concept of exclusion enclosures, although old (eg Australian Town and Country Journal, 26 November 1898), is not widespread, in India, and is being promoted by researchers and managers alike as a mitigation measure against crocodile attacks by Saltwater and Mugger Crocodiles (Whitaker 2008b). Interestingly, the use of enclosures in the Andaman Islands is not mentioned by Whitaker (2008c). Government authorities have established enclosures constructed of chain mesh wire and metal supports in some areas (Whitaker 2007, 2008a,b). However, although are stronger in the short-term, they are expensive to repair and maintain over time (Tarun Nair, pers. comm.). In the longer-term, the best option may be to provide local communities with a range of designs, and allow them to choose the one that they believe would be the best for their situation. In addition, they should invest in locally available materials and labour to construct and maintain enclosures, and thus provide a sense of ownership that is currently lacking. The establishment of CEEs requires not only extensive liaison with State Forest Departments with regard to placement, design and maintenance of CEEs, but there also needs to be the political will to actually go ahead. 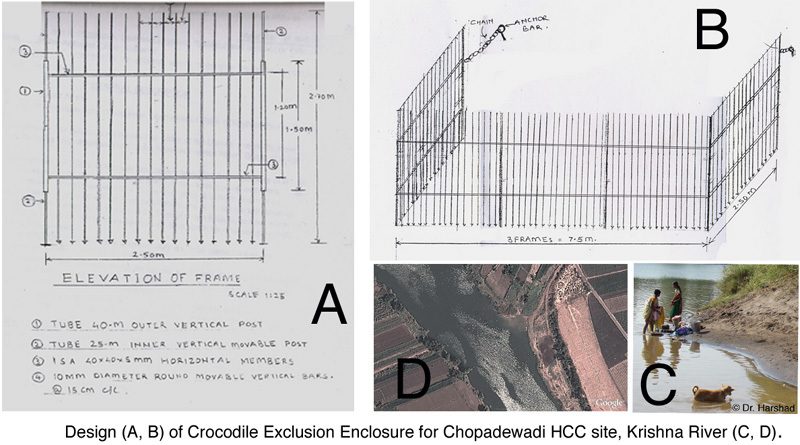 Nikhil Whitaker (Madras Crocodile Trust) provided an example of costings and designs for a CEE at Chopadewadi, a largely agrarian community on the Krishna River, in Maharashtra State (C, D below). Detailed plans (A, B below) and costings for all components (about $US565 at that time) were provided in 2008/09, yet the CEE has yet to be built. As the area is affected by a dam outlet upstream, there is provision for the steel rods to move as the substratum moves, however, when the river floods the enclosure must be dismantled. Another issue that compounds the problem is the rigid socio-cultural dynamics (caste system) in India, that result in only the dominant classes using CEEs, and the less dominant classes continuing to use riversides without any apparent protection (Tarun Nair, pers. comm.). Papua New Guinea: Barricades against attack by crocodiles were commonplace in the early 1900s in the rivers of the Papuan Gulf (The Queenslander, 4 March 1937) and easter provinces (The World's News, 27 December 1919). These were constructed of bamboo poles interlaced with other vegetation, and were semicircular in shape, often reaching halfway across the river. Where villages were on opposite sides of the river, both cooperated and built barricades right across the stream. Traps were also set for crocodiles that ventured close to the enclosures or which may have attempted to break through. It appears that such structure are no longer used, and people use crocodile sightings, previous HCC incidents and "experience to determine where they can or cannot use the water for bathing, washing, etc. (Godfrid Solmu, pers. comm.). Africa: The Queenslander (9 April 1927) refers to the use of a fenced off area that had been dug into the side of a river. It also relates how a Nile Crocodile (C. niloticus) grabbed a child, presumably from the bank, suggesting that it was not totally risk-proof. 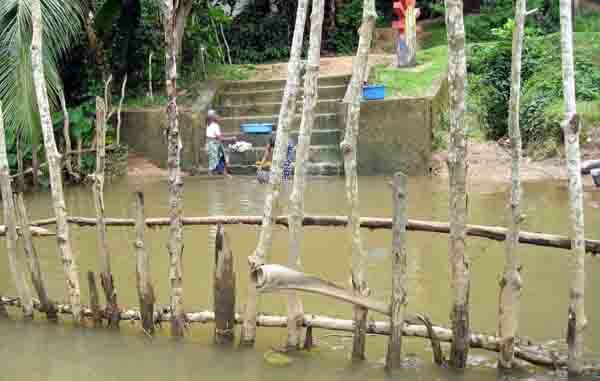 Following a spate of attacks, Ugandan authorities recently decided to construct a "crocodile fence" to protect villagers at water fetching points (FP Newsletter 2012). Fergusson (2008) indicates that the building of pallisades or enclosures to protect livestock was a good starting point, but maintenance was ongoing in order to ensure their effectiveness. Fergusson (2004) notes that in areas where crocodiles are considered to be aggressive (eg Shire River, Malawi), barriers are used to protect people at watering points. Australia: Fenced bathing areas have been used in the past, although such enclosures now are designed to protect bathers from jellyfish rather than crocodiles. In 1929, in Cairns, a man was bitten after a Saltwater crocodile (C. porosus) had made its way through holes in the surrounding fencing. In tidal areas where water levels can rise and fall by up to 7 m or more, the use of CEEs may be of limited utility. However, their application in non-tidal areas is currently under consideration.